Sometimes it is not possible to be at the ferry port or airport to collect your pets when they travel in from overseas. If this is ever a problem for you consider using the services of a pet courier company to collect and look after your pets until you are able to collect them. You may be deciding to travel overseas to live or on business. There are pet courier companies that can take all the worry of transporting your pets to and from the UK leaving you to concentrate on the family or your job. The courier will arrange all paperwork, crates and drop off times at the airport and then have someone to meet your pets when they return to the UK. They will also be able to kennel your pet until you are back in the country and able to collect the animal in person. If your pet is travelling in from a country that is not part of the pet travel scheme the pet will have to go into quarantine for six months. 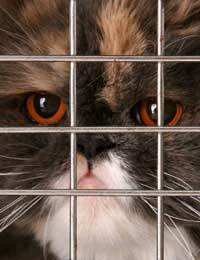 The quarantine establishment will arrange to collect your pet and transport him to the kennel where he will be booked in, checked by a vet and made comfortable in his new home. You will be able to visit your pet but will not be able to take him out of his kennel or run area. You may be lucky enough to have a friend or member of family that can meet your pet’s flight and take him home. Remember to give the friend a letter stating they have authority to collect the pet and all other paperwork relevant to its journey. The airline or travel company should also have your friends contact details in case of emergency. If it is just a matter of transporting your pet home from the airport or ferry it may be possible for a taxi cab to take your pet. Some companies won’t entertain dogs in their cars so it would be prudent to have the phone number of a pet taxi service to hand who can collect the pet and transport him home. Pet taxis are also ideal for non drivers when a pet needs transporting to a kennel or vets surgery. If your pet has to go into a kennel or cattery you may find that the owner will be prepared to collect your pet and transport it straight to their premises as part of their service. With your pet being transported and cared for by different people it is prudent to make sure that he is micro chipped with your details and also has a sturdy collar and tag that has up to date home details engraved upon it. If you are still out of the country you really need to have the details of someone who can act on your behalf in case of emergency. A second disc on the collar will take care of this.